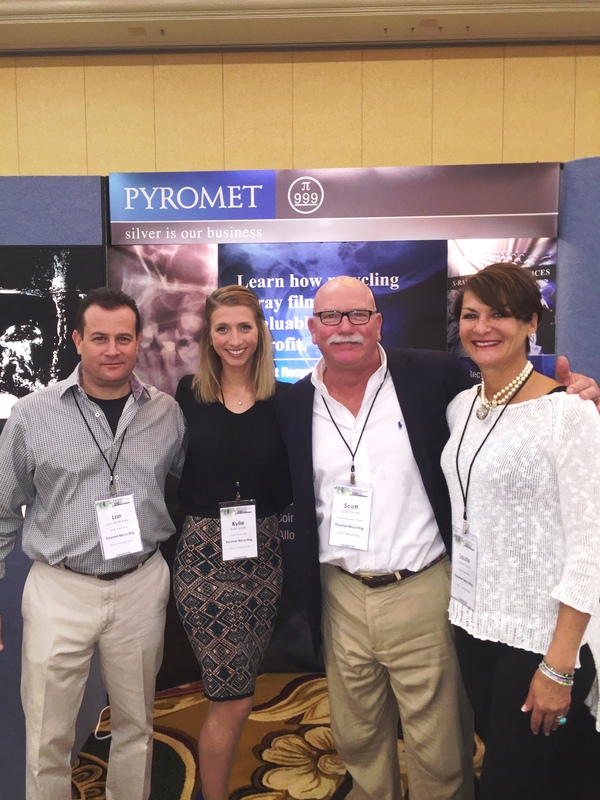 (Dallas, TX – March 20-21, 2015) Scott and Laurie Smith (owners of Pyromet), Lon Rudnitsky (Pyromet Film Recycling Partner), and Kylie Smith (Sales and Marketing Assistant) exhibit Pyromet’s silver refining services at this year’s NAID conference. NAID is the international trade association for companies providing information destruction services and holds a high standard of ethics for the industry. The NAID members that work directly with Pyromet can be assured of maximum silver returns and HIPAA compliance. Having current and potential customers all in one venue allows Pyromet to present their services.“Working hard for our customers is the highest priority, and having fun is a part of that,” said Scott Smith. Pyromet discussed business and opportunities to attendees. There was a lot of fun happening in booth 309. Pyromet held two different contests. If an attendee can get the film in the shot glass in a fish tank, the winner will receive a one ounce silver coin. There were fifteen silver coin winners. The grand prize winner, Nate Segall with AccuShred, won a $1,000 worth of silver. Guido DiIono from Neoshred, received second place winning $300 in silver. Third place, given to Lisa Clark from BondTech Corporation, won $150 of silver.